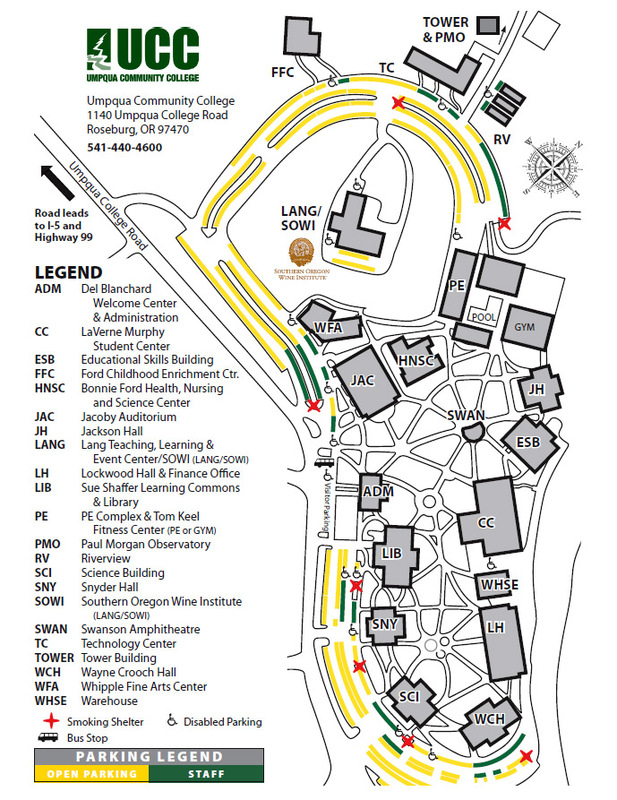 Umpqua Community College provides more than 1,400 parking spaces conveniently located near all the campus buildings. Students DO NOT need an annual parking permit. About 170 spaces are assigned to college faculty and staff. All employees are given a yearly parking permit. Designated parking spots for employees are marked by green lines, curbs and employee only signage. Designated parking for students and visitors are marked by yellow lines and curbs. Parking in front of the Del Blanchard Administration Building is limited to one hour. Parking spaces are marked by while lines. Specially designated parking areas are provided for motorcycles on campus. Bicycle racks are provided in numerous locations around campus. Individuals shall not chain bikes to posts, pipes, trees, etc. Bicycles must be walked, not ridden, through the interior areas of the Umpqua Community College campus. Foot traffic is the primary means of transportation within the internal passageways of the campus. For safety purposes, individuals should not use wheeled conveyances (other than disabled conveyances) such as skateboards, bikes, roller skates, roller blades, scooters, etc., at any time. Special placards are required for parking in clearly marked Disabled Parking spaces. These placards are issued by the Oregon Division of Motor Vehicles and must be prominently displayed when parking in a disabled parking space. Special permit required for parking at the student center east parking area. See Accessibility Services or Security Department. Traffic citations will be issued for improperly parked vehicles. The general parking fines range from $25.00 to $100.00. Penalties/fines may be paid through the finance cashier located in the Student Center. Any vehicle left unattended on UCC property for more than 72 consecutive hours will be deemed abandoned and towed at owner’s expense. All traffic and parking issues should be addressed through the Director of Facilities and Security. Any citation issued by the Security Department may be appealed to the Director of Facilities and Security for review. An appointment for appeal must be submitted to the Director of Facilities and Security at 440-4698 within three (3) working days of the issuance of the citation. Citations not appealed with this three (3) working day period may not be open to review. Umpqua Community College reserves the right to change any of these regulations without prior notice as needed for the safety and security of the campus. Such changes will be posted prominently throughout the campus community and through all available forms of campus communication lines.